I read this article and found it very interesting, thought it might be something for you. The article is called Keeping a Fox Out of the Chicken Coop and is located at https://www.chickencoopguides.com/keeping-fox-chicken-coop/. I will never forget stepping into my chicken coop to find a horrific scene filled with feathers, blood, and only two young Rhode Island Red pullets nervously huddled together in the rafters of the shed. Their eight coop mates were all wiped out in a single visit from a fox– an attack made possible by a small coop door accidentally left open after dark. The next evening we were even more shocked when we discovered that a fox had managed to get a day-old goat separated from the herd in the pasture next to our yard. The predator’s jaw was firmly clamped over the young goats’ head and it only abandoned its potential dinner when I charged out of the house shouting. I’ll admit my bravado was failing when the fox didn’t run away until I was a few feet away. Soon I heard reports of fox in our neighborhood stealing chickens in broad daylight. What ensued was a slightly unhealthy obsession with outwitting an animal known for being sly. In the end our solution came in the form of electric fencing. I soon discovered that electric netting or hot wires placed strategically can help train fox to avoid your specific area. If fox, or other predators such as racoon, pose a risk in your area I recommend setting up electric fence in good weather. Heavy snowfall and ice storms in Idaho can temporarily take electric fence out of commission– especially if you are using portable netting. During the hot dry summers I also found that I had to trim the weeds around the fence regularly and even used a soaker hose to keep the perimeter of the fence line damp enough to make sure the fence continued to conduct electricity effectively. Overall, my experience the use of electrical netting in good weather seemed to convince predators that they should explore other hunting grounds on a permanent basis. Even with the help of electric fencing I still recommend securing your chickens inside a sturdy coop at night. 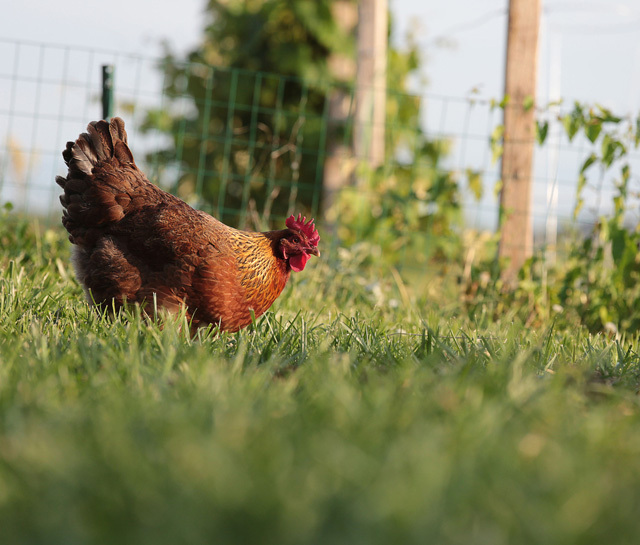 Have you experienced your own struggles protecting your chickens from predators? Or do you have a chicken raising tip to share with our online community? We’d love to hear from you! Just send us an e-mail. And remember, whether it’s time to build your first coop or upgrade to a new hen house we have high quality plans available in our book bundles. With every $29 purchase you get immediate access to a digital copy and if you choose the $49 (plus shipping) bundle we’ll also ship a hard copy to your home. How about keeping your too resourceful neighbors out of your chicken coop? There’s a lot of them here in our area….